The race for the Verizon P1 Award from the Toyota Grand Prix of Long Beach took place on a warm afternoon. Lap times early in groups 1 and 2 were down slightly from the morning’s Final Practice as the drivers wrestled their 2018 cars around the Streets of Long Beach hoping for pole position at a track that has proven difficult to pass at. 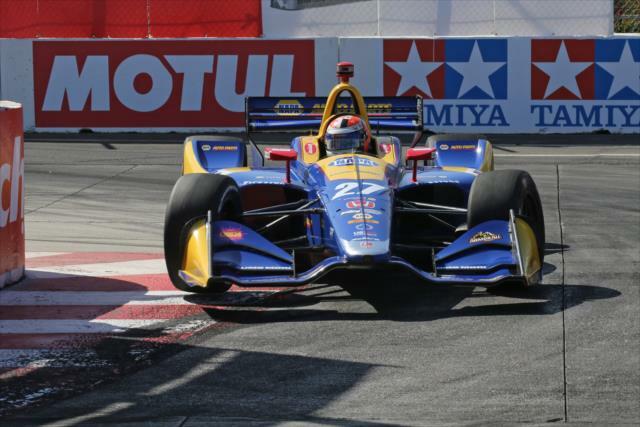 Alexander Rossi of Andretti Autosport put Honda power on pole with a time of 1:06.553 in a spirited Firestone Fast Six session to wrap up Saturday from the Beach. Rossi will look to fend off Will Power who will start alongside him on the front row in the long run down to Turn 1 in Long Beach. Power posted a time of 1:06.905. Fellow Penske stablemate Simon Pagenaud leads Row 2 with a time of 1:06.911. Scott Dixon starts behind Pagenaud with a time of 1:07.048 for Chip Ganassi Racing. Graham Rahal posted a time of 1:07.128 in his Honda machine and Josef Newgarden closed out the top 3 rows with a time of 1:07.192 after contacting the wall exiting Turn 7 in the final round of qualifying. Group 1 consisted of reigning series champion Josef Newgarden, Ryan Hunter-Reay, Graham Rahal, Scott Dixon, Ed Jones, Jordan King, Robert Wickens, Gabby Chaves, Jack Harvey, Charlie Kimball, Max Chilton, and Zachary Claman De Melo. Josef Newgarden led the way of drivers advancing to Round 2 with a time of 1:07.706. His Penske machine was the only car to dip into the 1:07s in Group 1. Scott Dixon set the second fastest time of Group 1 with a 1:07.790. Josef Newgarden posted a 1:07.812. Robert Wickens posted a 1:07.989. Graham Rahal crossed the line with a 1:08.036 and Jordan King rounded out the top 6 advancing to round 2 with a 1:08.293. Group 2 consisted of Alexander Rossi, Will Power, Simon Pagenaud, Spencer Pigot, Tony Kanaan, Sebastien Bourdais, Marco Andretti, Takuma Sato, Zach Veach, Kyle Kaiser, last year’s winner James Hinchcliffe, and Matheus Leist. The top driver from this morning’s Final Practice Alexander Rossi set the pace again in Group 2 with a time of 1:07.171 for Andretti Autosport. Simon Pagenaud finished just behind Rossi with a 1:07.548. Sebastien Bourdais advanced with a time of 1:07.566. Will Power joined his teammate Pagenaud in advancing to Round 2 with a time of 1:07.587 in his Penske car. Last year’s winner James Hinchcliffe found himself in 5th at the end of the Group 2 session with a time of 1:07.689. The final car to advance was the #14 of Tony Kanaan. The veteran driving for AJ Foyt Racing posted a 1:07.891. Group 2 had a couple of incidents as Kyle Kaiser tagged the wall on the exit of Turn 11 early in the session and coasted into pitlane. Marco Andretti spun but recovered quickly later in the session. That left seven Honda powered cars and six Chevrolet powered machines advancing to Round 2. Will Power topped Round 2 with a last second lap time of 1:06.571. Alexander Rossi and Scott Dixon were separated by a thousandth of a second in second and third place with times of 1:06.833 and 1:06.834 respectively. Josef Newgarden posted a 1:06.883. His teammate Simon Pagenaud posted a 1:06.906 for Team Penske. The final car advancing was the #15 Honda powered machine driven by Graham Rahal. Rahal posted a time of 1:07.090. The Firestone Fast Six consisted of three Hondas and three Chevrolets setting the stage for a manufacturer showdown. With Wickens and Bourdais eliminated, the Verizon IndyCar series would see its third different Verizon P1 Award Winner of the young season as Alexander Rossi took his Honda Powered Andretti machine to pole position. This marks Rossi’s first Verizon P1 award. Rossi’s time of 1:06.553 was clinched after Josef Newgarden slapped the wall with his left rear Firestone tire exiting Turn 7. The green flag flies for the 44th Toyota Grand Prix of Long Beach tomorrow at 1:40 PDT, 4:40 EDT. Stay tuned to Open-Wheels.com for continuing coverage from the Beach.